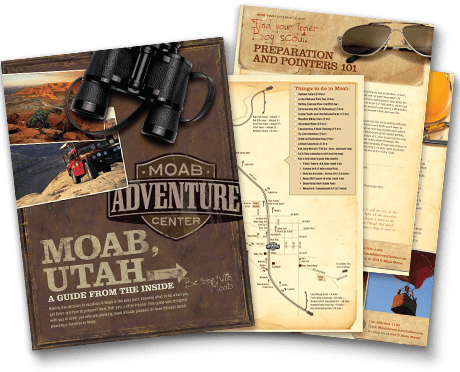 Moab offers something for every rider, from beginners who want to enjoy the scenery to the most daring riders wanting to push their boundaries. Epic 25 miles of downhill in the La Sal Mountains. Highest elevation is 11,216’ and ends at about 4,000’ by the Colorado River. This system contains 6 trails including Burro Pass, Hazard County, and the upper, lower and Porcupine Rim trails. Recommended only for experienced riders since all sections contain difficult and technical areas. Approximate 4.4 miles of intermediate difficulty. Changing terrain, climbs and descends keep riders focus on the trail ahead. This is the last section of the Whole Enchilada trail, approximately 11.5 miles. Very difficult and has several technical sections that may require riders to walk their bikes through some areas. Approximately 22 miles of difficult and expert riding. Highest elevation is about 6,000’ and the lowest is about 4,000’. Most of this trail is single track with an average of 5% grade, max grade is 20%. 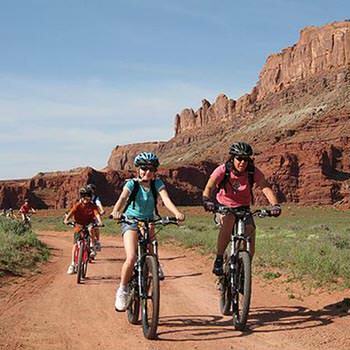 Extensive network of trails located in the outskirts of Arches National Park. It offers easier routes for families to more difficult single-track trails for the most experienced riders; anywhere from 6 to 12 miles depending on the chosen route. This area offers approximately 17 miles of single-track trails. Trails include easy, intermediate, intermediate sections with slickrock, sandy washes, and hard-packed surfaces. Moderate to intermediate 12 miles of challenging slickrock, sandy washes, and sustained climbs. Dinosaur footprints can be found along the trail. The iconic Slickrock trail is very difficult and technical, approximate 10.5 miles. The trail includes steep climbs, sandy sections, and petrified dunes. This 100 mile trail is recommended for experienced long-distance riders. Is best if done in 3 to 5 days with a vehicle support and overnight camping along the route. The highest elevation is approximately 6,183’ and the lowest is about 3,900’. The average grade is 2% with a max grade of about 47%. Intermediate 12 to 16 miles of trails. Riders are required to have cardio fitness, stamina and technical riding experience. There is mostly slickrock terrain with ledges, drops and bowls.